Nanny Poppinz of Atlanta is excited to be able to offer Nanny child care and domestic solutions to families in the Atlanta, Georgia area. Many Atlanta and Alpheretta families work non-traditional hours, travel, have single parent households, are busy executives, and/or need flexible childcare options. Nanny Poppinz is here to fill that service need for flexible and professional Nanny childcare service in the Atlanta area. Trusted since 1992, we screen and personally interview every Nanny we refer! NO FEES of any kind unless and until you hire your Atlanta Nanny. FREE in home consultation direct with the owner. A "Live" Nanny call center available to Atlanta 24/7 including evenings, holidays and weekends. All Atlanta Nanny referrals have 3 years verifiable Nanny childcare work experience and CPR certification including AED and First Aid training. Each Nanny is legal to work in Atlanta. Emergency Nanny childcare service and 6 month Nanny replacement guarantee for all full & part time Nanny Poppinz Atlanta families. This Nanny replacement guarantee is the best in the Nanny industry. Proudly offers Nanny referral fee discounts to Atlanta GA military, law enforcement and Federal Government families. 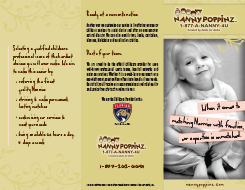 Why use Nanny Poppinz of Alpharetta? Nanny Poppinz has successfully referred Nanny childcare to over 43,000 happy families since 1992. We have established a track record of serving Atlanta Alpharetta families and Nannies. There are no up front fees to family or Nanny. There are no application fees to family or Nanny. You pay nothing until you hire a Nanny. We face-to-face interview every Nanny we send to your Atlanta home. Nanny Candidates have at least 3 years of verifiable child care experience and are thoroughly background checked BEFORE you interview them. The Nanny is ready to be hired when you meet them. At Nanny Poppinz of Atlanta, we customize our services to meet your family's needs including overnight and/or emergency back up Nanny care. We are available in a moments notice 24/7. We specialize in dispatching a Nanny in just moments after receiving your call for assistance with your emergency childcare Nanny needs. We customize our service by sending a Nanny who can work anywhere from one evening up to a full-time live-in and everything in between. Whatever the family services needs, whether it is short-term like a summer Nanny, or long-term like a permanent part time or full time Nanny, we find candidates for our Atlanta and Alpharetta families to interview. Every family has unique childcare needs or problems, and at the Alpharetta Nanny Poppinz agency we aim to be the SOLUTION in Atlanta. Nanny Poppinz of Atlanta Alpharetta Nanny service is available 24 hours per day, 7 days per week for our Atlanta Georgia families because we as moms ourselves know that childcare emergencies do not happen from 9am to 5pm Monday through Friday. When you call (678) 608-2769 you will speak to a representative of Nanny Poppinz Alpharetta who can listen to your needs and solve your Nanny childcare problem no matter the time of day or night. Our clients tell us that this Nanny service and availability ANYTIME gives them such "peace of mind". We understand the importance of finding the best possible Nanny care for our most precious assets, our children. Many Atlanta families choose a Nanny agency to care for their children due to flexibility with schedules, a lower occurrence of illness, customized one on one care, and a comfortable and SAFE at home environment. At Nanny Poppinz, WE WILL BE YOUR ATLANTA NANNY CHILDCARE SOLUTION! Please call us at (678) 608-2769 to start the interview process. Nanny CPR, First Aid and AED training will be provided by CPR With Mickey. Each Nanny can schedule their CPR course by calling for a reservation at 770-573-2448 or by going to the CPR With Mickey website www.cprwithmickey.com. Identify yourself as a Nanny Poppinz Nanny when you make the reservation (you will receive a discount). After the completion of the course and when you have been referred as a full or part time Nanny Poppinz Nanny, you will need to send the course receipt to Nanny Poppinz and you will be reimbursed by Nanny Poppinz for your CPR training cost. Prospective Alpharetta Nanny Poppinz Nanny Interview Schedule Please call Dasly at 954-899-3828 for an interview.